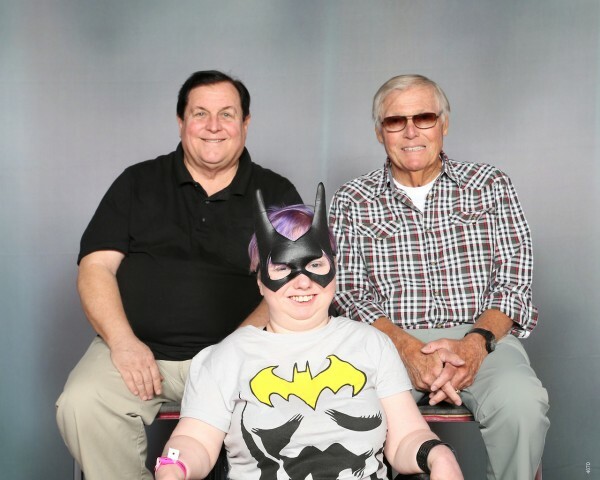 I had the honor of meeting Adam West and Burt Ward at Motor City Comic Con 2016. Last year was the 50th anniversary of the original Batman TV show and they announced that they would be doing con tours in its honor, but that it would be the last year they would go on tour as they were both retiring from the convention circuit. I was probably 4 or 5 years old when the show started rerunning on the weekend and my dad and I would watch together. When I told my dad that they were going to be at the convention I was attending, he reached into his wallet, pulled out some cash, handed it to me and said, "I want a picture. You better bring me a picture." Thanks to my dad, I got the chance to meet Adam West before he passed away. I remember when I came into the photo booth with my Batgirl costume on, he loudly declared, "Well now we're talking! Alright!" Which made my day. I'm so thankful I got the chance to meet these two great actors and I was sorry to hear that Adam West passed away this week. The Batcave is good and all, but I know he is someplace even better now. Rest in peace, Mr. West, rest in peace. I love that picture and I love that Adam West got a kick out of your costume! I know, it made my day!! It would have made my whole weekend, but the next day James Marsters (Spike from Buffy) told me I have a beautiful smile!! Comic Con was such a great experience!